10:24pm: FanRag’s Jon Heyman reports that Abad’s minor league deal with the Mets in late March was indeed axed when the Mets learned of his failed PED test shortly before the deal became official (all Twitter links). Importantly, he notes that Abad went through a lengthy appeal process that was ultimately unsuccessful. However, the beginning of his suspension is retroactive to the filing of the appeal, meaning his suspension will actually finish being served later this month. Heyman also relays a statement from Abad in which he, like many suspended players before him, indicates that he didn’t knowingly take a banned substance. 3:50pm: Free agent left-handed reliever Fernando Abad has received an 80-game ban after testing positive for Stanozolol, the league announced. The 32-year-old Abad was with the Phillies in Spring Training and, after being cut loose, agreed to a minor league deal with the Mets. Abad never appeared in a game with the Mets though, and his contract with the club seemed to have fallen through at some point (quite possibly due to the impending suspension). Any club that signs Abad now will do so knowing that he’ll have to sit out for 80 games upon the deal’s completion. At this point in the schedule, an 80-game suspension would put Abad out for the vast majority of the season. Abad drew fairly limited interest this past offseason despite the fact that he turned in a solid 2017 season with the Red Sox. In 43 2/3 frames with Boston last year, he pitched to a 3.30 ERA with 7.6 K/9, 2.9 BB/9, 0.82 HR/9 and a 45 percent ground-ball rate. Lefties hit just .224/.288/.348 against him, and it was his second consecutive season with an ERA well south of 4.00 in more than 40 innings of work. In fact, Abad has somewhat quietly worked to a 3.13 ERA with a 206-to-80 K/BB ratio in 233 innings from 2013-17. He worked primarily in low-leverage spots with the Red Sox last year, though, often pitching when the game was already out of hand and the team was behind. In 317 2/3 career innings at the big league level, Abad has a 3.65 ERA with 38 holds, two saves, 7.7 K/9, 3.2 BB/9 and a 40.7 percent ground-ball rate. Proof they don’t always make you better. Wonder how much of that was inflated by “Stanozolol”? quick google search, see it’s an anabolic steroid.. Doubtful any. If he was using then, he would have gotten caught. I imagine he started in spring trying to get a big league job again. Everyone tends to look at PEDs as some sort of magical elixir that makes you a great ballplayer. I see them as a last chance for guys on the way out or a way to rehab an injury more quickly for others. Number of positive tests for Biogenesis players? “Number of positive tests for Biogenesis players? Zero.” Congrats on the dumbest comparison of the day. Bosch’s Boy were 2013 and it opened the eyes of the MLBPA as they finally consented to WADA testing. In 2013 the standard for a failed test was ridiculously low, a 4:1 T:E (Testosterone to Epistestosterone) Ratio. There was no biological passport program, no IRMS (Isotope Ratio Mass Spectrometry) tests to detect biological marker months after the PED has cleared the system, and no HGH blood tests. bosox2004’s comment is indented twice from yours, so… probably not directed at you, actually. Just breath Xabial, it will be okay. End of the day, BOS has the highest payroll, but shed Hanley 20M. Mookie’s DL stint very minor. He’s eligible to activated Friday but I think he gets few rehab games, be back soon. You still my favorite Red Sox poster man. Nothing but class. One of the few. For what it’s worth, Pierce is 4-0 his last 5 starts, and lowered his ERA to 4.08. Not really. The “better” part doesn’t mean “better than those who don’t use PEDs.” It means “better than he would have been without PEDs” and we aren’t in a position to know that. We’d have to have some baseline “clean” stats to compare with his “artificially augmented” stats to determine whether they worked for him. Abad : I thought my milkshake tasted funny! Players don’t always take them to make them “better”. They take PEDs to recover faster from strain or injury. And NOT A SINGLE ONE “knowingly ingested a banned substance” including a masking agent. (Yeah, right) The classiest of the cheaters cost other people their jobs in their denials. They should all be banned from the HOF and make their TEAM be banned from the World Series. Guaranteed there would be some team policing and accountability at that point. No more team managers, doctors and trainers feeding players this stuff & lying about it. Afraid it doesn’t work that way. Teams are limited by the terms of the basic agreement. They may not decide to impose additional testing on their own. They take PEDs to help them recover from workouts faster, thus enabling the player to work out harder and more frequently. It is assumed that this additional conditioning leads to “better” performance. How many admitted users or players who failed a test have been admitted to the HoF? All MLB has to do is place users on the permanently ineligible list and neither the BBWAA nor the Veterans committee can do a thing about it. He’s been A Bad boy. Not A bad job done by all…..
I’ve got A Bad headache from reading these puns. Disgraceful, what Abad thing he did trying to cheat like that. I was waiting for someone to make a joke with his name so I could down vote them. Two can play at that game, fake teeth. are you waiting to get a life too? I can go out and get a life or I can waste my life on baseball websites. I’ve made my decision and I’m sticking to it. Baseball websites are great but I’d strongly suggest you hit a website with a few good jokes to borrow while you’re online. I was waiting for you to post so I could downvote you. He tested positive for the capital of the Ottoman Empire? That should throw the contestants a curve…..
Well, this makes at least 6 Dominicans who have been suspended since Marte last year. Me thinks if the Dominicans are buying their supplements (or if they are intending to buy the juice) from sources in the Dominican, maybe they should somewhere else for the supplements. There have been rumors for a long time that the DR has had a lot of PED stuff going on and since it’s another country, it was very difficult for MLB to verify anything. Maybe they have figured out the process there and/or have a mole on the island. If other DR players have been using, they’d be very nervous right now. It’s not rumors, it’s facts. There’s been many great articles about how PED’s are ingrained in the Dominican baseball culture. For most of the DR players, they start out using them as a way to escape poverty. While only 10% of MLB players are Dominican, more than 41% of the 58 players suspended for PED’s since testing began are Dominican. It’s a clear problem, but MLB will not address it because of the obvious potential repercussions. They can be bought over the counter in the DR! Stanzo? Really? Come on dude, it’s not the 60’s anymore. hey bell bottoms came back in style, I guess the old drugs did too. Haha, yes! Papi loaded up on Fenway Franks as a masking agent. 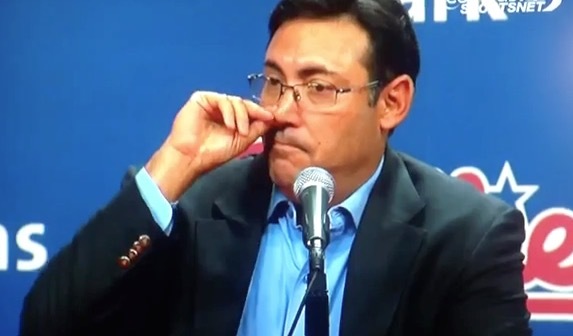 A guy maybe on his last legs trying to find a major league deal….I’d almost feel sorry for him. Except not. For every one guy caught, the number of others who manage to use and escape detection must be a serious multiple. Explain this logic, please. “He was caught, so the testing system must not work” makes literally zero sense. The cheaters are usually ahead of the system. This guy used old juice. Anybody who uses a banned substance to gain an advantage is a cheater, doesn’t matter what they use. The only difference is the guys who are in a better financial position can afford the better stuff. Simply put, he was on the Sox last year almost by default as a lefty. He was the most untrusted reliever Farrell probably ever had. Stanozolol? Really? After all this time? Ben Johnson would be proud. Retroactive? I dont really understand that. Isn’t he a free agent? I thought suspensions don’t begin until you sign with a team? And he’s not really losing any money from the suspension if he’s not getting paid to begin with. Weird. But his suspension was known by the teams and is why he has no job. So yes he’s losing money. I agree, he will atleast get a minor league deal somewhere. Look at how awful Bartolo was last year and he still got one and caught lightning in a bottle. Teams will take a chance if minimum dollars involved. Despite all this and the fact he’ll be good to go later this month, he won’t get a job in the majors. Dude was unemployed before all this happened for a reason.